“It shows no signs whatever of the rough handling that it has received at the hands of our pupils who have used it continuously for practicing and evening amusement.” That was how J. W. Hill, M.D. described the durability of the piano purchased for Bishop Scott Academy in Portland, Oregon. The piano he was referring to was an Ivers & Pond piano manufactured by Ivers & Pond Piano Co. They made grand, square, and upright pianos. This circa 1890 trade catalog by Ivers & Pond Piano Co. illustrates some of the pianos available for purchase at the time. Ivers & Pond Piano Co., Boston, MA. 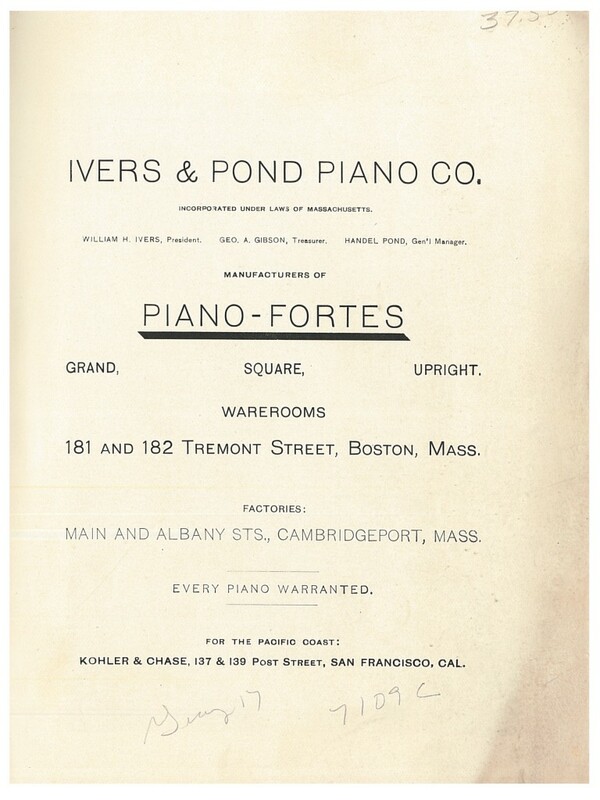 Ivers & Pond Pianos, circa 1890, title page. The upright piano was described by Ivers & Pond as “THE PIANO OF TO-DAY” and one which “possesses, to a large degree, the features of the Grand–VOLUME, SINGING POWER, SWEETNESS OF TONE, and SYMPATHETIC TOUCH, the action resembling the Grand in its repeating capacity.” Shown below is Style O, an Upright piano available in rosewood finish. Ivers & Pond Piano Co., Boston, MA. 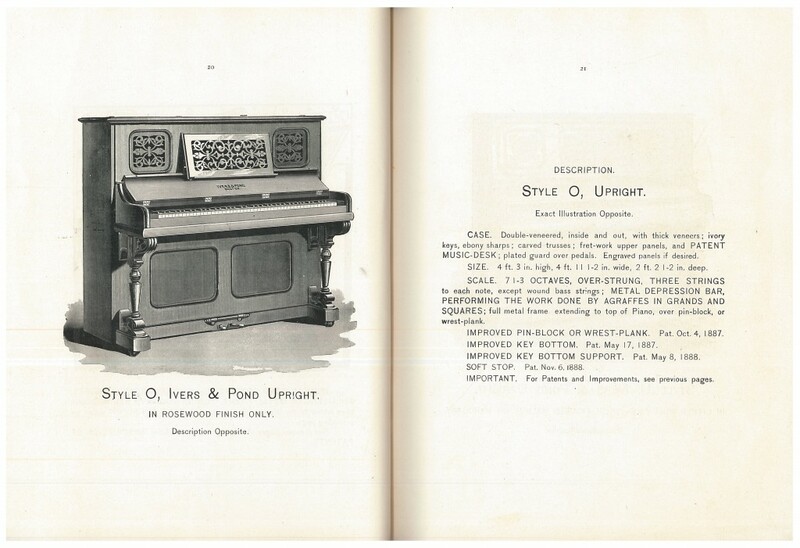 Ivers & Pond Pianos, circa 1890, pages 20-21, Style O, Ivers & Pond Upright Piano. For a closer look at the construction of the Ivers & Pond Grand Style 13, take a look at the pages below. The left page shows the wooden skeleton frame of the piano. The right page shows the piano after the sound-board, bridges, metal frame, tuning pins, agraffes, and strings were placed onto the wooden skeleton. Ivers & Pond Piano Co., Boston, MA. 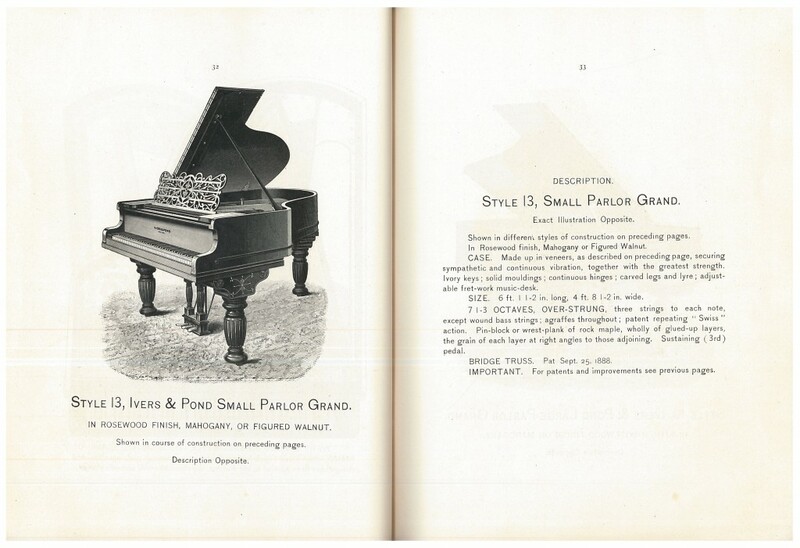 Ivers & Pond Pianos, circa 1890, pages 30-31, Ivers & Pond Grand Style 13 Piano. 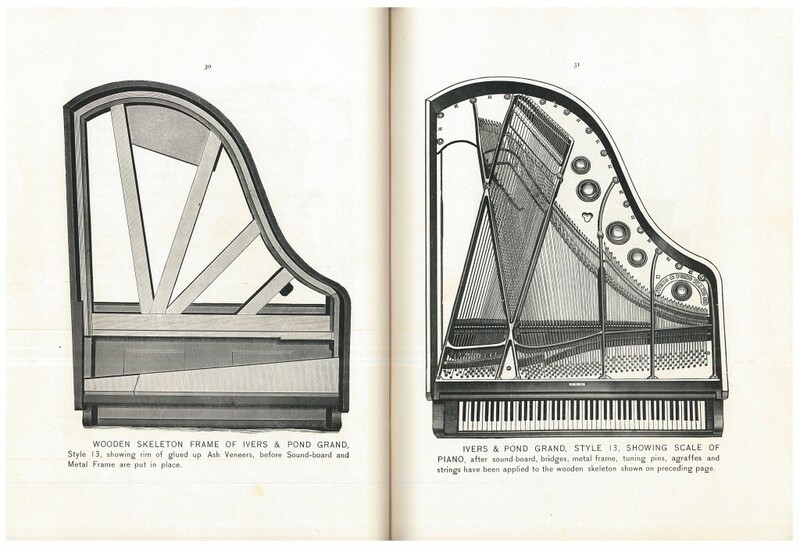 Left page shows wooden skeleton frame of piano and right page shows scale of piano. The second half of the catalog includes page after page of testimonials from happy customers. Many of these customers mention the durability of the pianos, especially for schools and colleges. Ivers & Pond Piano Co., Boston, MA. 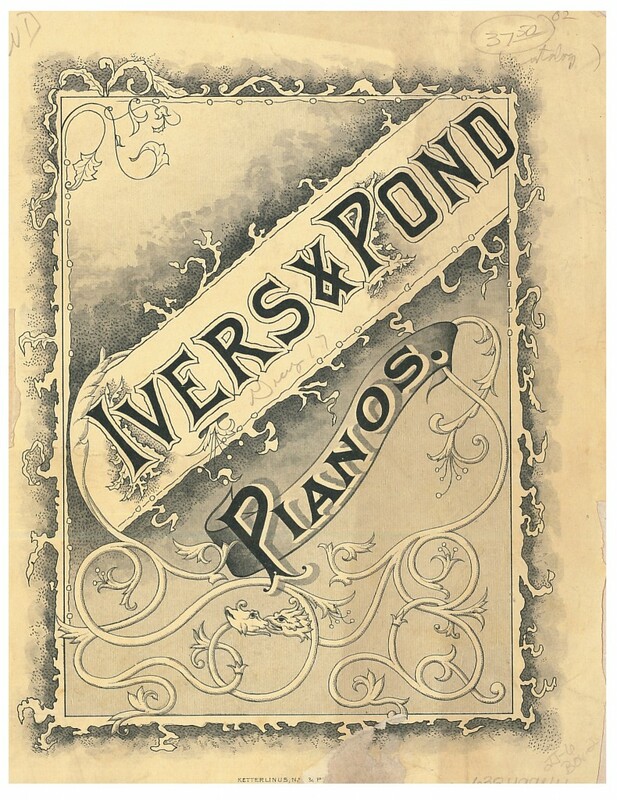 Ivers & Pond Pianos, circa 1890, front cover of catalog. This trade catalog by Ivers & Pond Piano Co. is located in the Trade Literature Collection at the National Museum of American History Library. Interested in other trade catalogs related to pianos? How about toy pianos? Take a look at a previous blog post about Schoenhut toy pianos. Ivers & Pond Piano Co. Previous Post Welcome, Jennifer Jarvis!